In Part III we discussed how Christianity was birthed as a direct threat to Paganism and their entire society, eventually overthrowing Paganism through the symphony of Emperor St Constantine and the Church. Christ came for this very reason, to destroy the power of Satan, to which Paganism was Satan’s very embodiment to the world. The saints teach us that the Christian monarchy that helped the Church overcome Paganism, would one day be dissolved, ending the protection of the Church and initiating the release of Satan back on the earth. How is Satan’s Pagan religion going to resurface? Will it be a sudden re-entry of sorts, or has the groundwork already been done, and the assault already underway? What community or nation could possibly accompany the return of Satan’s war against the Church? How could such a community be built right under our noses? In the video below, scholars show us how America…yes, America, has been designed by anti-Orthodox men and women for the creation of what they see as “The New Order.” The New Order is Satanic in its core and opposes the Gospel in its communal/missional form by re-introducing Christianity as ‘ONE OF THE MANY’ ways to reach God, just as the ancient emperors imposed upon the early Christians. It is no coincident that America has produced the largest amount of ecumenical cults in the world, including Mormonism, which is was birthed from this ecumenical, Freemason, movement within Americas founding. From there, shortly after Joseph Smith’s movement and the Revolutionary war, cults began birthing like they never have before. The country slid right down to a civil war and the possibility of sovereign states to produce identifiable Christian communities ceased to exist. The New World Order was underway, and Satan’s next stop was Greece and Holy Russia, the final and most threatening monarchies to the Pagan world. Here is the video link. Feel free to look over the notes below the video for a snapshot of some of the specifics. ~ The Pagan belief involves doctrines of dominion in order to build cities and entire societies, aligning them with astrological elements and gods, thwarting the foundation of community within the Christian faith. The Christian faith now is corralled in to a private, temple-based religion, rather than the communal movement that she was founded on, and the empire that it grew into. In one sense, the American movement is Paganism’s vengeance on what Christianity did to Rome and all the east. ~ Rosicrucian and Freemason symbols are all over the country, especially Washington, within architecture, paintings and government seals. ~ Freemasonry was akin to the Rosicrucians, enabling American founders to create an ecumenical society, starting with the Revolution. ~ Blazing Star (pentagram) is a key symbol within much of Freemasonry. America’s capital is built in this shape. It would be far too much of a coincident, considering all of the Freemason influence at that time. Some Freemasons are unaware of the plans to create the capital based on this and are impressed that it could have happened by spiritual force. ~ Cosmic feminine and masculine powers taught by Apollo and Athena, as well as Kahballa, are foundational to these cultic teachings. Statues are placed within America to represent this belief of “gender power.” The Boyscout Memorial is one that contains the boy scout in front of “the divine offspring,” statues of divine man and woman who are connected to the gods. ~ Freemasons have laid cornerstones at every major building in Washington, including the Capital. 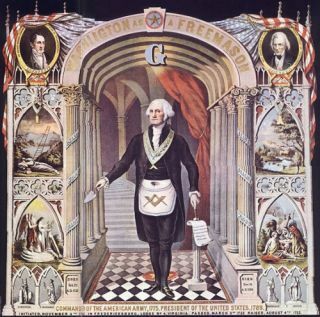 ~ Washington laid the cornerstone on the capital, wearing his Freemason garb. ~ They use corn, wine, and oil to “bless” the cornerstone. The god Dagan and Ball are the ancient gods of corn. The ancient Hebrews offered corn, oil, and wine to ball. ~Washington Memorial is modeled after Egyptian monument, which is dedicated to Ball. ~ Ex Mason says their symbols are cultic and that they reveal to the right people. In others words, they empower anti-Christian people. ~ Third level Masons teach that our energy comes from Sirius, the dog star of the Ancient Egyptians. The Great pyramid was built in line with Siruius for rituals in pyramid. ~ Washington monument cornerstone was laid when the sun passed over Siruius. Robert Mills, Mason, designed the monument, combining Egyptian and Roman cultic design. ~ (42 min) FDR was a mason who believed America had a destiny….had Wallace as his VP who was a 32 degree mason. Placed the Americas ‘Great Seal” on the dollar with “the New Order of the Ages” in Latin. ~ The General Gordon Meade of the Union won the bloodiest battle against General Lee in Gettysburg. This is considered to be the battle that decided the victory of the Union. In the statue, Meade is carved in front of gods and goddesses with a halo-like seal above his head, representing that he was empowered by these forces to win the battle. This statue sits on Pennsylvania Ave in Washington. ~ Albert Pikes statue is also in Washington. He taught that the light of Masonry was from Lucifer.